Home » News of the Mumonkan club » The results of the training season 2011-2012. Dear colleagues and friends! The training season 2011-2012 has ended, and we would like to sum up briefly its main results. In 2012 the Mumonkan Aikido Club celebrated its 15th anniversary. On May 12 Minsk hosted Aikido seminar devoted to this significant event. The seminar was attended by representatives of branches of the club from Vitsebsk and Navapolatsk, as well as by our colleagues from Grodno and from Moscow Dzen Thai Aikido Club. Students of Mumonkan Aikido Club have taken part in a traditional annual training and certification seminar under the guidance by Mr. Makoto Ito, an instructor of Aikido Aikikai Hombu Dojo. 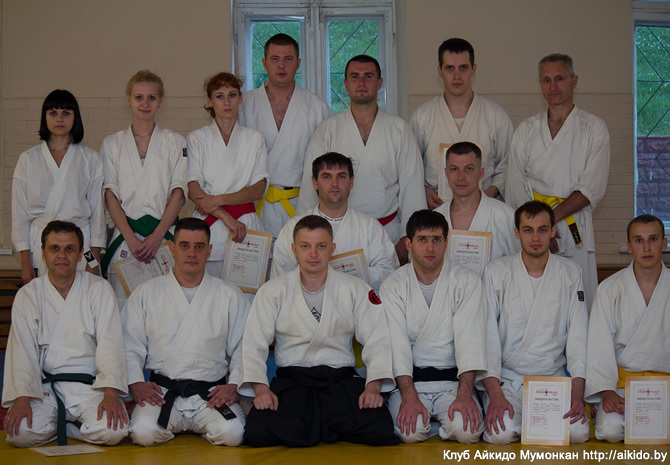 The last training season was rich in seminars of Mr. Vitaliy Goleshev, the head of Mumonkan Aikido Club. Of these, we would like to single out two introductory seminars on Aikido. 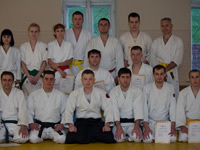 The first seminar was held in St. Petersburg at the Centre of Aikido and Ju-Jutsu Gosinkan in December 2011, the second Aikido seminar was held in Minsk in January 2012. We are pleased to note that this year representatives of the press have paid attention to us. In April 2012 correspondents of "Minsk Courier" newspaper came to a training at our club. As a result of this visit an article "The Way of a Samurai" (in Russian) was published in the newspaper. During the past period (since September 2011) 24 representatives of the club have successfully passed certification examinations. Of these, 8 students passed the exam for 4 kyu, 6 students received 5 kyu and 10 students passed the exam for 6 kyu of Aikido. We heartily congratulate the certified students and wish persistence, patience and further success in mastering their Aikido. Dear friends, since July 1, 2012 the Mumonkan Aikido Club announces summer vacation. There will be no trainings during this period. We will inform you further in advance about the date of commencement of trainings. The results of the training season 2010-2011.